A true American legend and the most popular entry in Ford's market-dominating F-Series of trucks, the Ford F-150 has long been favored as a workhorse for farm and ranch, as well as a choice for tuners and off-road enthusiasts. Available in a wide variety of trims and configurations, the rugged Ford F-150 delivers exceptional functionality and power to spare. Although styles and options have changed through the years, reliability and durability remain the hallmark of this solid pickup. It's no wonder the F-150 continues to be a mainstay in Ford's line and a favorite bargain in the used-truck marketplace. The F-150 grew out of the Ford F-Series trucks, which date back to 1948. 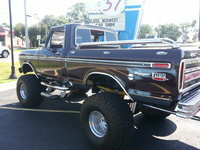 The F-150 made its debut in 1975 for the 1976 model year, as part of the sixth generation of the F-Series. Ford designed the F-150 specifically to meet upcoming federal emissions requirements. Since the F-100, which was also in production at the time, was often referred to as a half-ton pickup, the F-150 became unofficially known as a heavy half-ton pickup. That year, the F-Series became the best-selling truck in the U.S., and it would go on to become the best-selling vehicle in the U.S. for more than 20 years, as well as the best-selling truck for more than 30 years. Once the F-150 entered the F-Series lineup, it never left. Currently in its seventh generation (the 12th generation overall for the F-Series), the F-150 straddles the line between daily commuter and light-duty work truck. It sits on a high-strength hydro-formed chassis and delivers a car-like ride and handling, yet offers impressive towing capacity of between 10,400 and 17,100 pounds, depending on the engine and drivetrain configuration. Inside, features like the Ford Sync communications system give the cabin a high-tech feel. 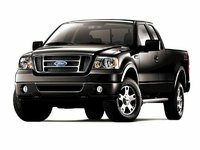 For 2011, the F-150 comes in 11 trim levels, including the entry-level XL, the sport-oriented STX, the mid-level XLT, the off-road-oriented FX2, and the high-end Lariat, as well as the FX4, SVT Raptor, King Ranch, Platinum, Lariat Limited, and special-edition Harley-Davidson, which joined the lineup in 2010. In an effort to improve the F-150's fuel economy, Ford adds two new EcoBoost V6 engines to the range of powerplants available for 2011. A new 3.7-liter Ti-VCT, DOCH V6 generating 302 hp becomes the new standard powerplant, while a 3.5-liter V6 with direct injection and twin turbos arrives later in the 2011 model year. It's expected to be the more fuel efficient of the two. Ford has not yet released fuel economy numbers for the 2011 EcoBoost V6s, but the numbers certainly will be an improvement over the average of about 15/20 mpg for the previous year's powerplants. The V6 engines join a range of available V8 engines, including a new 400-hp, 6.2-liter V8 for the Raptor trim level. The powerplants drive the various F-150 trucks through two available transmissions and either rear-wheel- or four-wheel-drive configurations. In addition, buyers can chose from Regular Cab, SuperCab, and SuperCrew body styles, as well as three bed lengths of 5.5, 6.5, and 8 feet. The F-150's nimble handling, despite its size, continues to impress owners and reviewers, although all admit the F-150 feels at times like the large truck it is. Despite a number of improvements to the chassis, some still find the ride too harsh, especially over rough roads. Ford has gone to great lengths to give the cabin a more car-like feel, with above-average fit and finish, and a relatively quiet driving experience for passengers. With the arrival of the F-150's current generation still relatively fresh (it debuted in 2009), it will more than likely not see any significant updates for a number of years. However, Ford continues to tweak the F-150 lineup with engine, feature, and trim updates to meet the needs and interests of a wide range of buyers. 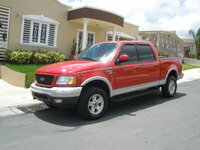 One area of expansion could be at the lower end, since the Ford Ranger compact pickup truck will disappear after the 2011 model year. Buyers can expect the F-150 to pick up the slack, which explains the arrival of the more fuel-efficient V6 engines for low-end trims. 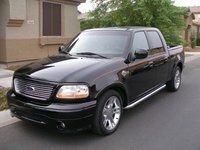 Rumors of a diesel powerplant for the F-150 remain unfounded, but potential buyers can expect Ford to continue to develop more efficient powerplants in the coming years, as the automaker attempts to strike a delicate balance between fuel economy and the high levels of performance buyers expect from the country's top-selling pickup truck. 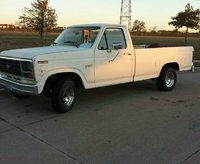 By the time the Ford F-150 arrived in showrooms in 1976, the F-Series pickup trucks had long been an American institution. Dating back to the mid-1940s, the F-Series established itself as a workhorse as well as a cultural icon. 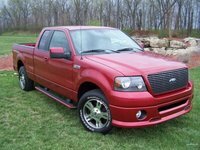 By the sixth generation, when the F-150 debuted, the F-Series came in a wide range of trims and configurations, powered by an equally wide range of V6 and V8 engines. In addition, the F-Series was built in a number of plants in the U.S., as well as plants in Canada, Mexico, and Argentina. 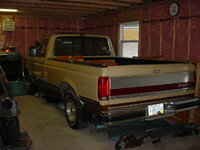 Ford designed the F-150 to fill a niche between the F-100 and F-200. It quickly became popular with farmers and ranchers, as well as off-roaders, and accounted for one-third of F-Series sales in its first year. 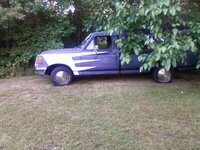 Body styles included a two-door cab, four-door crewcab, and four-door supercab, while available engines included a 130-hp, 5.0-liter Windsor V8 and a 200-hp, 7.5-liter 385 V8, as well as a 5.8-liter FE V8 and a 3.9-liter straight-6. Initially the F-150 came in Custom, Sport, Ranger, and Ranger XLT trims, though Ford offered the F-150 in an upscale Lariat trim level two years later, in 1978. 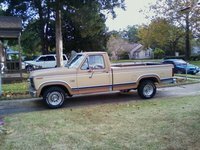 Also in '78, Ford added a 169-hp Cleveland V8 to the range of available engines. Outside, the F-150 displayed an aluminum-bar grille and round headlights with black accents, although the Lariat trim featured rectangular headlights when it debuted. 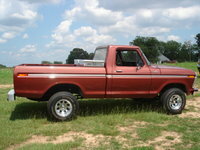 The Ford F-150 received a redesign in 1980, when the F-Series' seventh generation debuted. 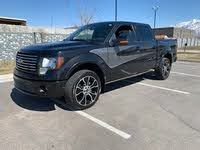 The F-150's exterior displayed a square shape in the front end, with flat panels and sharply creased edges. A new four-speed automatic joined the options list, and four-wheel-drive (4WD) trims featured a new independent front suspension. Engine choices included the Windsor V8, the Cleveland V8, and a 165-hp, 4.9-liter straight-6. In 1982, Ford dropped the Ranger trim designation from the F-Series lineup, since the automaker decided to use that name for its new series of compact pickup trucks. As a result, the new F-150 trim lineup for '82 included the XL, XLS, XLT Lariat, and Explorer. Also in '82, the F-150 displayed a new front grille equipped with the blue Ford oval logo, making its first appearance on the F-Series trucks. A total of 15 engines, including a new 110-hp Essex V6 and a 245-hp 385 V8, powered the F-Series. In 1983, the F-150 became the first F-Series truck offered with an available diesel engine, which put out 170 hp. 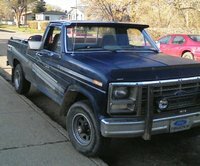 For the 1984 model year, Ford discontinued the F-100, making the F-150 the entry-level truck in the F-Series lineup. In 1985, Ford offered the F-150 with an optional fuel-injected 5.0-liter Windsor V8 engine, making the F-150 the first F-Series truck equipped with a fuel-injected engine. 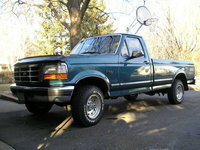 The F-150's square-shouldered shape was rounded off a little for the F-Series' eighth generation, which debuted in 1987. Rear antilock brakes became a standard feature, making the F-150 and the entire F-Series the first trucks with this type of safety equipment. 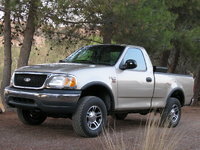 F-150 trims included the XL, XLT, and XLT Lariat, with two-door, extended cab, and super-cab body styles. 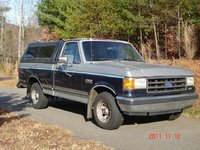 By 1988, all powerplants available for the F-150, including a beefy 180-hp, 7.3-liter diesel V8 built by International Harvester, came equipped with fuel injection. 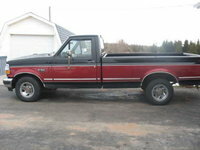 Buyers could also equip the F-150 with an available five-speed transmission in '88. Off-roaders welcomed the addition of automatic locking hubs on 4WD-equipped F-150 trims for 1989. 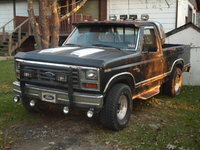 However, the technology was not extended to other F-Series trucks until 1991, demonstrating the important position the F-150 held in the automaker's lineup. 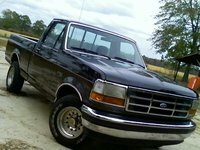 The F-150 received a more streamlined exterior design in 1992, when the ninth-generation F-Series debuted. 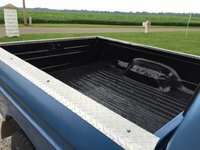 In addition, Ford re-introduced the F-150 with a flareside bed, which placed the rear wheel wells outside the bed, rather than inside. It was a look that helped distinguish the first three generations of the F-Series, and gave the F-150 a hunkier, retro look. The interior received a new dashboard, among other features, while trims again included the XL, XLT, and XLT Lariat, in two-door and four-door body styles, with short or long beds. Ford also added a new 195-hp turbodiesel V8 to the engine lineup. 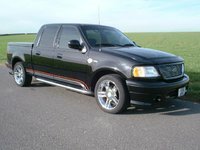 For 1993, Ford introduced a sporty SVT Lightning trim, which came equipped with a number of first-time features, including gas shocks, 17-inch aluminum wheels, and a sport-oriented suspension tuned by race-car driver Jackie Stewart. Power came from a 240-hp, 5.8-liter V8 engine. A year later, in 1994, Ford added a driver's-side airbag and CFC-free air conditioning as standard features for certain trims, while a CD player, remote keyless entry, and a power-adjustable driver's seat were among the options. 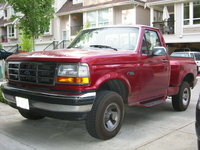 For 1995, Ford offered the F-150 in an upscale Eddie Bauer trim, which replaced the XLT Lariat trim. By the time the 10th-generation F-Series arrived in 1997, the squarish look for the front end had completely disappeared, replaced by a rounded, more aerodynamic design. 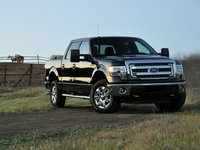 In fact, the 10th generation represented the F-Series' first full redesign since 1980. 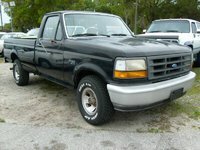 Uncertain if the new appearance and plusher interiors would appeal to dedicated truck buyers, Ford continued to sell the ninth-generation F-Series into the '97 model year. 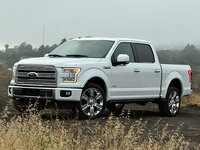 However, buyers took readily to the new F-150, and Motor Trend named it the Truck of the Year. For this generation, the top-of-the-line Lariat trim returned to the lineup, replacing the Eddie Bauer trim level. Other trim levels included Standard, XL, and XLT. Engine choices included a 4.2-liter Essex V6, a 4.6-liter Triton V8, and a 235-hp, 5.4-liter Triton V8. Despite the accolades it received, the F-150 did not perform well in safety tests, causing the IIHS to saddle it with a Poor rating for protecting passengers during frontal accidents, and placing the F-150 near the bottom of some safety-oriented lists. 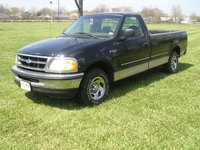 In 1999, Ford added new Lightning, Harley-Davidson, and King Ranch packages to the F-150 lineup. A SuperCrew body style, with four full-size doors, rolled into showrooms in 2001. The 11th-generation F-Series, which debuted in 2004, sat on a new P2 platform, resulting in longer (by 6 inches) and wider (by 4 inches) cabs. For the first time, all cabs had four doors, with the Regular cabs receiving rear-hinged half-doors. The SuperCrew retained its four full doors. 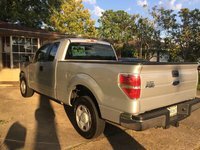 Initially for the 11th generation, Ford offered the F-150 with only two Triton V8 engines, a base 231-hp, 4.6-liter powerplant and an optional 300-hp, 5.4-liter unit. The V8s were paired with a four-speed automatic transmission, and for the first time Ford mounted the shift lever on the floor. Four-wheel antilock brakes came standard. 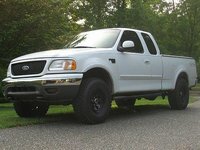 XL, STX, XLT, FX4, and Lariat trims were available. Ford also continued to offer a limited-edition version of the previous-generation's F-150, called the Heritage, which included an updated grille. In 2007, Ford added an FX2 trim, based on the FX4. A Foose Edition, based on the FX2 Sport, debuted in 2008, and a new high-end Platinum trim came along in 2009. In addition, in '09 Ford updated the F-150's frame to make it lighter and more rigid, and the current 12th-generation F-150 debuted at the North American International Auto Show in Detroit. Even though the Ford F-150 retains a fairly good resale value, prospective buyers should have little problem finding a version they want at a price they can afford, given the sheer numbers of F-150s produced over the years. In 1997, for instance, Ford offered the F-150 in no less than 51 different configurations, and for more than three decades the F-150 was the best-selling truck in America. If you extrapolate the numbers, you can quickly see the vast number of choices available to prospective F-150 buyers. 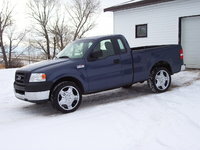 The F-150's 11th generation, produced from 2004 to 2008, would probably be a good place to start for prospective buyers. The 11th generation received a new platform, which resulted in more spacious cabs. In addition, all trims offered the convenience of four doors, as well as the aerodynamic exterior lines introduced with the 10th generation. In the safety department, four-wheel antilock brakes became a standard feature for the 11th generation. Buyers who place safety at a high priority should avoid the 10th-generation F-150, which was built from 1997 to 2003, since it received a Poor safety rating from the IIHS. On the other hand, the 1997 F-150 was awarded Truck of the Year by Motor Trend, and added such trims as the Harley Davidson and the King Ranch to the F-150 lineup, making trucks from this generation well worth a look. In recent years, the F-150 has taken a big step in improving interior comfort, with such trims as the Harley Davidson and Platinum approaching luxury-sedan levels, thanks to features like leather seating and heated rear seats. Ford also equips its late-model F-150s with its Sync communications system, which gives the cabs a high-tech feel. These trims offer unique opportunities for buyers. On the other hand, those seeking something other than fully decked out F-150s should have no problems finding plenty of solid, dependable entry-level XL and XLT trims, including those from the truck's earliest generations, which continue to make good buys. 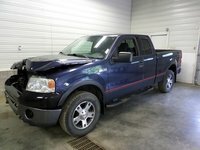 Start a new Ford F-150 question. Draining My Fuel Injector/carburetor ?